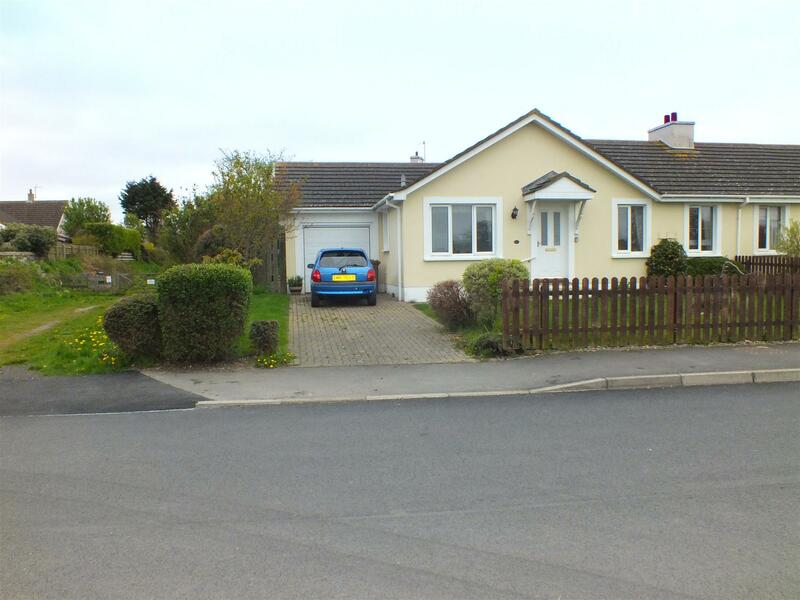 Modern Semi Detached True Bungalow in a Popular Village Location. Walking Distance to all Amenities, Main Bus Route, School & Pub. 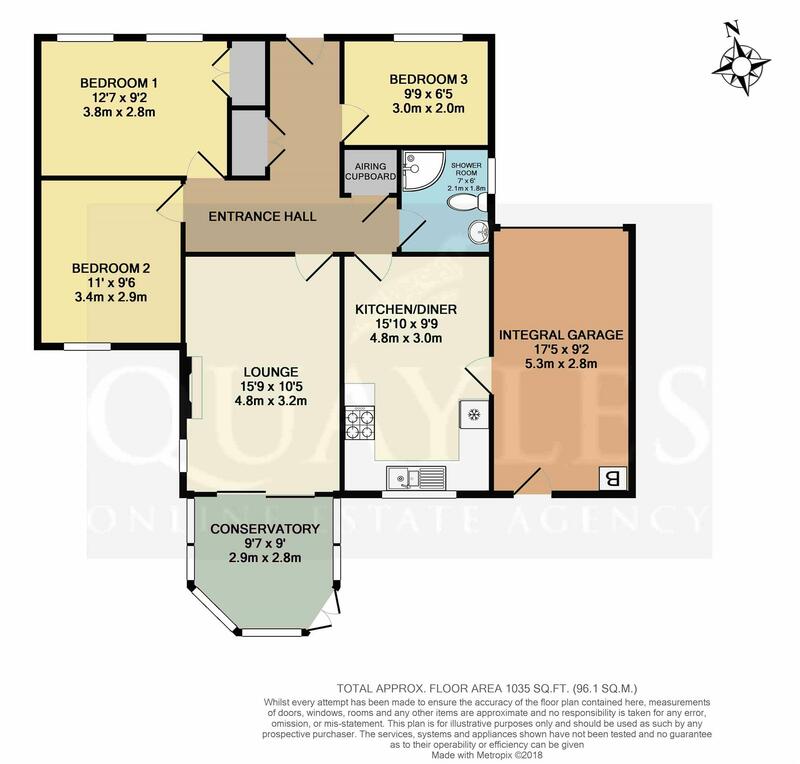 Bright & Spacious Accommodation with Good Built In Storage. Lounge with Conservatory Off Plus a Spacious Dining Kitchen. 3 Generous Bedrooms (2 Doubles) & Shower Room/ Former Bathroom. Front Lawn and Block Paved Driveway Providing Parking for 2 Cars. Good Size Enclosed Garden to the Rear Enjoying a Southerly Aspect. From Douglas head west following the signs for Peel then taking a right turn at the Ballacraine crossroads and continuing on to Kirk Michael. On entering the village, continue past Michael Primary School and The Mitre Pub then take the next left turn into Station Road. Follow the road along and the property will be found on the left hand side of the road, just opposite the entrance to Cannan Avenue. Painted wooden entrance door with decorative double glazed inserts. A spacious area with a built-in cloaks cupboard having a hanging rail and shelf. Built-in shelved airing cupboard. Coved ceiling. Smoke detector. Power point. A well proportioned room featuring a traditional style fireplace with an electric fire. Having a uPVC window to the side and sliding double glazed doors to the conservatory. Television, satellite and telephone points. Coved ceiling. Of uPVC construction with a tinted polycarbonate roof and double doors to the rear garden. Tiled floor. Power points. NB no radiator to this room. A spacious room with ample space for a table and chairs, along with a dresser or small sofa if required. Fitted to the rear with a good range of modern oak effect wall, base and drawer line units together with laminate work surfaces incorporating a 1 1/4 bowl stainless steel sink with a lever mixer tap. Integrated fridge and freezer. Built-in dishwasher. Inset four burner gas hob with a filter hood above and an electric oven below. Background tiling. Garden views via a uPVC window. Coved ceiling. Tile effect flooring. Door to the integral garage. Fully tiled to complement the white 'Roca' suite of WC and pedestal basin with an illuminated mirror above. A large quadrant enclosure houses a fully plumbed, thermostatically controlled shower. Hand rail. Obscure glazed uPVC window. Mirror fronted vanity unit. Coved ceiling with spotlight fitting. Extractor. Display niche. A double room with a uPVC window to the rear. Coved ceiling. Space for free standing furniture. A further double room with two uPVC windows to the front. Recessed built-in wardrobe with a hanging rail and high level shelving. Coved ceiling. Shelf for a TV. Space for free standing furniture. A generous single room with a large uPVC window to the front elevation. Coved ceiling. Space for free standing furniture. To the front is a good size lawn with fencing to the front and neighbours boundary, along with shaped beds. A block paved drive provides off road parking for two cars and leads directly to the integral garage. A further lawned area to the side a gated access to the rear garden. An established garden enjoying a southerly aspect and having fencing and shrubbery to the boundaries. Mostly laid to lawn with paved pathways and two patios. Wooden storage shed. Cold water point. External light and polyethylene oil storage tank. A single garage with an up and over panelled door. Light and power points. 'Worcester' oil fired boiler. Space and plumbing for a washing machine. Space for a tumble dryer and freezer. Half obscure glazed wooden door to the rear garden. All mains services are installed. Oil fired central heating and uPVC double glazing.